The Ugly Bug Ball – Just Writing! Sharona had a great summer job. She would be heading up to northern Minnesota for eight weeks, working as a nanny for a wealthy family. Four kids, two dogs. The kids were spread over a span of years ranging from five years old to thirteen, three girls and the prince of the family. He was seven, and as cute as could be. Danny. Then Buffy, the five-year-old, and Sara and Jannie, who were 11 and 13. They were going up to the “cabin.” When Sharona first heard that, she pictured a rustic log shelter with very few amenities, and hoped seriously that there was an indoor bathroom. She really hated outhouses. Really, really hated them. They flew from the southern part of the state to a little airport in the heartland, and then drove from there. The cabin was on a beautiful lake, situated so that you hardly saw it through the surrounding trees. When it was in full view, Sharona’s jaw dropped. Cabin, indeed. It was a gorgeous summer home, built to withstand all kinds of weather. Spacious, ideally designed for the woods, and situated right on a point so that it was surrounded by water on three sides. Wow. Swimming right off the back dock. Boating. Picnics every day, and lots of sun. They got settled in, and the days passed quickly. They swam, they ate, they boated. Sharona did a good bit of the cooking and cleaning up, but mostly her duties involved being with the children. Suited her just fine. Little Buffy loved to catch minnows with her bare hands, and could spend hours crouched in the shallow water waiting for one to swim into her cupped hands. The two older girls were very comfortable in the water, and Danny was constantly on the move. Sharona stayed busy all day, every day. The only things she hated was the bugs. 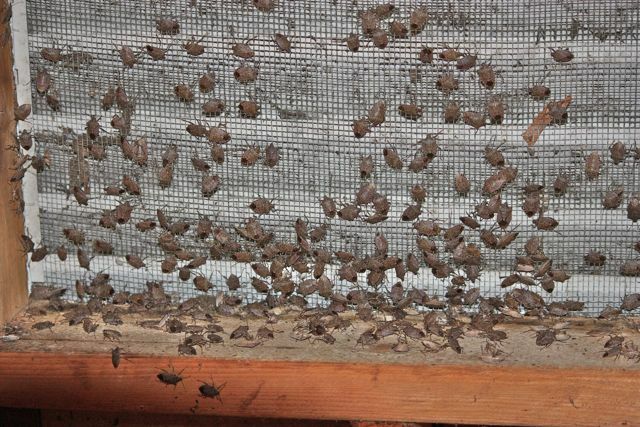 Not so much in the daytime, but at night when the house lights went on, the bugs would collect against the screens. Their ugly, tiny little feet stuck to the screens like glue, and they’d hang there twitching their antennae and being hideous, sometimes making an ominous buzzing/humming noise that drove Sharona right up the wall. The room she shared with the children had one complete wall of screened windows. It was bug heaven. Eventually, they didn’t even leave when the sun rose. They just hung there twenty-four seven. Nightmares of all varieties. “Sure,” said Sharona. “No problem.” Nooooooooo! I can’t DO that! They give me the cold chills, and they’ll all come after me the first time I step outside. Oh no, oh no, oh no. Worst job ever. I guess I should be glad it’s not snakes! Armed with the broom, Sharona poked at the screens. The bugs flew up, but then settled right back down. Oh, brother. She got a bit more aggressive, sweeping the broom across the screens with swaths, knowing she was probably breaking little buggy legs and maybe even wings. Gaaaah. This was torture! Finally, after repeatedly clearing the screens, the bugs had all disappeared. And the goose bumps all over her body settled down. She checked an hour later. A few stragglers had come back, staking their claim on several square inches of screen. Out came the broom. Off went the bugs. Yuck. One more time before the family came home. love it….well not the horrible bugs that bugged people…the burl Ives song and the cartoon……..ah, the memories of childhood emerged!